Note：The schedule is subject to the practical conditions on site of the exposition. During the Mushroom Expo, the “Thirty-Year Anniversary Marking the Foundation of the Mushroom Association of Hubei Province”, the “Exhibition of Photographing, Calligraphy and Painting Competition Works of the 2014 China Mushroom” as well as such selecting and prize-presenting activities as “My Favorite Mushroom Product” and “The Most Reliable Mushroom Brand in My View” will be held. Meanwhile, the “Annual Conference of China Mushroom Industry for 2014 and the Hubei Mushroom Industrial Technology Conference” will also be held. Experts will deliver reports on the Conference; and other arranged content include: the Roundtable Forum for China Mushroom Machinery and Equipments, the Roundtable Forum for China Mushroom Raw and Auxiliary Material and Pesticide Medicals, Hubei Province’s Mushroom Industrial Technology Conference, the Press Conference on China’s Mushroom Culture Village Strategy, the Press Release of the New Products and New Technologies of Mushroom, the Investment-attracting Presentations, and the Visit to the Factorized Enterprises of Mushroom. For detailed information, please refer to the official website of the Mushroom Expo. Exhibitors, who will make the payment prior to August 15th, 2014, will have their company/product information included in the Exposition’s publication free of cost. 2. Board and Lodging Expenses: the exhibition site has points of service for Chinese take-away. The exhibition representatives can buy the take-away on their own, and the reference unit price for the take-away is US $8. In the mean time, the representatives to the “Annual Conference of China Mushroom Industry, 2014” are arranged to dine at the Wuhan Riverside Garden Hotel, the reception hotel assigned by this Expo. If the representatives have the need to purchase meal coupons, the price is RMB 20yuan/meal. The reception hotel assigned by the Mushroom Expo is Wuhan Riverside Garden Hotel. The price of a standard room is US $60/room (including two meals of breakfasts.) The hotel accommodation shall be booked from the organizing committee before August 15th, 2014, and the room-booking charges shall be paid. After that date, the room charge at the hotel is set according to the day’s retail price, and the availability is not guaranteed. Due to the limited number of houses, it would be better for the representatives to the Exposition to book rooms in advance. The Hotel’s phone number is 027-87782888. The exhibitors and representatives can contact other economical hotels on their own. 1. The Move-in time of the Mushroom Expo is September 13th and 14th; the exhibition time is September 15th and 16th; after eight o’clock on 13th, the exhibitors shall enter the site to arrange the exposition by displaying exhibitor pass; from 8:00 to 17:00 on 17th, the move-out shall be completed. 2. The specification for a standard booth is 3×3m, with an area of 9m2. It contains one exhibition lintel with the exhibitor’s name, a three-sided hoard (the double-opening booth has two lintels and a two-sided hoard), a desk and two chairs, two spotlights, a power socket of 220V/10A, site security precaution, and site cleaning service. 3. The specially decorated booths will be constructed by the exhibitors, and the exposition center charges an administration fee of RMB 15yuan/m2. The Exposition Center also collects a cash pledge of RMB 5000yuan on garbage collecting, a pledge of RMB 10yuan/voucher for constructing inside. The cash pledges will be returned after move-out. 4. The opening time of the exhibition center is from 8:00 to 17:00. If the time for arranging exhibition exceeds the opening time, the center can charge for the extra-work expense. But it should stop before the night’s 24:00, and the organization needing the extra work should apply for it before the day’s 16:30. For application after 16:30, an additional 30% of expediting cost will be charged. 5. Exhibitors who need three-phase electricity (dynamic electricity) should apply for paid installation from the exhibition center before 16:30 on 14th. 6. The bearing-load of the unit area inside the exhibition hall must not exceed 2tons/m2. 7. The exhibited goods should comply with the state relevant regulations, and have relevant qualifications and production limits. The products should be exhibited beyond the limit of the booth. Within three meters of the booth, the noise should be less than 80 db. 8. Such illegal products as counterfeits, shoddy products and right-infringing products are not allowed to be exhibited. Relevant legal liabilities shall be undertaken solely by the exhibitor. As for the goods on exhibit that have trademark, patent, and Intellectual property dispute, the organizing committee is entitled to ask for their removal. 9. The products that threaten public security, such as inflammables and explosives, are not provided with the exhibiting services. 10. During the exhibitions, the exhibitors shall take care of their own personal effects and personal valuables. 11. The layout of booths on site of the exhibition shall prevail. 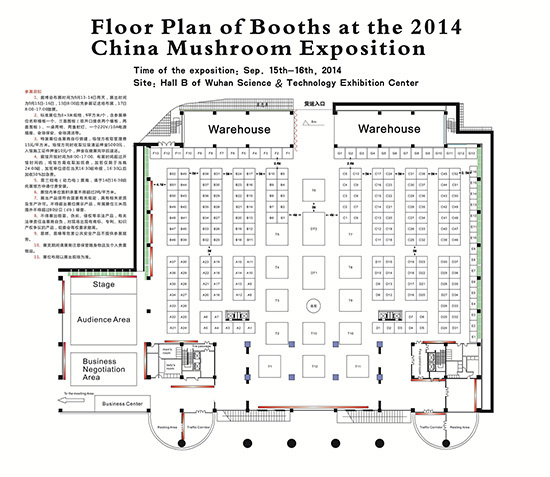 The Mushroom Expo will compile a volume of Exposition Publication. If you need the advertising service, the deadline for the publication is August, 15th. Charging standard is US $250/page of the wedge color page. The Mushroom Expo sincerely calls for organizations or individuals who aspire to promote the development of China’s mushroom industry to sponsor this exposition. The sponsorship can be divided into five levels: Diamond Sponsor (US $16000), Platinum Sponsor (US $12000), Gold Sponsor (US $8000), Silver Sponsor (US $5000), Bronze Sponsor (US $2000). The organizing committee will grant relevant certificates to them accordingly, and provide corresponding promotional services. The deadline for applying for sponsorship is August 25th, 2014. Bank of Deposit: Software Park Sub-branch in Wuhan of Industrial and Commercial Bank of China Inc.